Bookish Lifestyle: Blog Re-Design: Lady Reader's Bookstuff + INT Giveaway! Blog Re-Design: Lady Reader's Bookstuff + INT Giveaway! Hello lovelies! :) Today I have another blog re-design news to share with you! I've been working on a new design for Amy from Lady Reader's Bookstuff (and that is precisely why I haven't been around much these days - well, that, and Wilson puppy!). Amy is just the kindest, sweetest and most awesome person and I wanted to re-design her blog as a Christmas gift. In the end, I didn't make it on time for it to be her Christmas present, but I'm still pretty happy with the way the blog turned out :) Hope you guys will like it, too! Make sure to click over to Lady Reader's Bookstuff and follow Amy! She has an amazing blog and she recently started organizing blog tours as well (and they're awesome! ), so be sure to follow her closely! And again, to celebrate Amy's new design I have a giveaway for you! SO SORRY! There will be a new giveaway to replace this one up on the blog soon! LOVE IT! WOOT! WOOT! The moon, the stars, the adorable short hair, the stack of books...perfection ladies! Well done! I like the new look. It is easy to read, and easy on the eyes. It's a fantastic change! Such a colorful and fun design! You did a really great job! Hope Amy's New Year is as cheerful as her blog! Thank you so much for being so awesome with Amy!! Skipping the giveaway since the BookDepo doesn't ship here but thank you anyway. You have done a fantastic job on her blog. I love yours as well. Very clever. I was wondering when I was going to find out who made it :) good work! i like it! very spiffy indeed! and i JUST started following you not too long ago, too! The colors are great, nice job. I really like the new design, especially the stars. I'm loving the colors, especially the background. It makes for very easy reading. I like very much the new design and I think it's very interesting even is simple! awesome look! really beautiful design! Lovely! I like the new look. It's very Amy :) Great work! I really like it! Love the color scheme. The design is gorgeous!! Great job babe! I like it. It is a cartoon but not look like a cartoon. Does that make sense? I love the look of the blog. You have such talent. Love the new look. The custom buttons are great. I love the new look. It looks great. I really like that the design is comprised of just a few colors, keeping the blog clean and simple. The header is where all the fun is happening and I really like that about this blog. I am also a fan of the clean organization tabs at the very top. Overall, excellent job! Very cute! Have a Happy New Year! I like the new look. It looks really great. The new look to start the new year. Cute! It looks great! Making me sleepy at way past my bedtime! I really like the colors, and the simplicity. Very clean. Love it! Evie, you're just so talented! Love this design, it is just so pretty! I like the design and the color scheme. I love it! The colors and design match well and its so pretty! Someday, when I am ready to start my own blog, I will come to you. Absolutely gorgeous! :) Thanks for the giveaway! Oh, it looks really pretty! Great job, Evie! That design was amazing! BEAUTIFUL new design. Evie, you are super talented! WOW!! What a change! I have to say that I totally love it! It looks more fun and love the colors! Awesome blog!! It's so pretty! Love the blue! I love the color, and the social media buttons are cute. It's girly, very bookish and fresh! 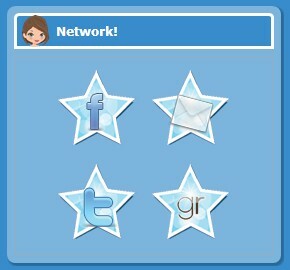 SO cute..I would love to be able to start off my new-ish blog with an adorable design similar to that. Do you design blogs as a business? I've been looking for something similar. Love the new look - calming colours, clear outlay. Great job! Love the new look. Plus, I love stars and the colour blue. This new look, looks awesome! I love the color, the details of the design looks so much interesting. :) two thumbs up! The new design looks so sleek! Is there any particular program that you use for design?